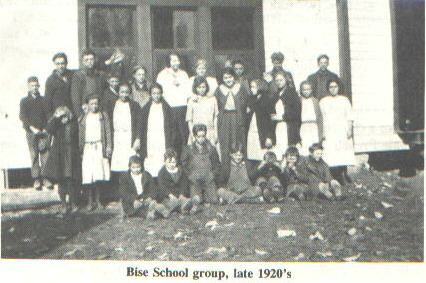 The Bise School started in 1910. The first school was taught in an old building used for a church and Odd Fellow Hall. Some of the very first teachers were Maggie French, Maggie Keel, Martin Reedy, Lee Stanley and Vicey Johnson. The first room to the present building was built in 1915, but for two years before the new room was added, the grammar grades had been taught in the old Hall. 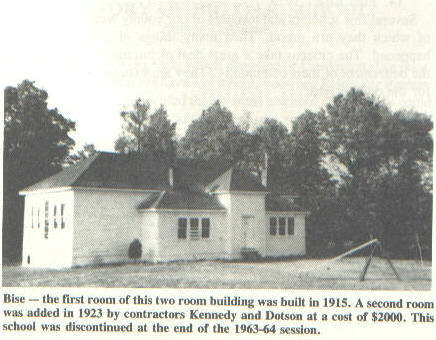 The new room was built in 1922. Some of the teachers that have taught here are; Blanche Neel, Lesie Dougherty, Hettie Bise, Mrs. J. H. T. Sutherland, Harold Remines, Edie Clay, Oma Arrowwood, Beula McCowan, Mrs. Della Rose, Garfield Baker, Violet Reedy and Pearl Bise. Or you may telephone Greg Yates at 315-768-7660. He would be very glad to hear from you.